We are delighted to present the findings of a new evaluation of our Sounding Out ex-prisoner programme from 2016-18, undertaken by Dr Rachel Massie, Andrew Jolly and Professor Laura Caulfield from the Institute of Community Research and Development, University of Wolverhampton. 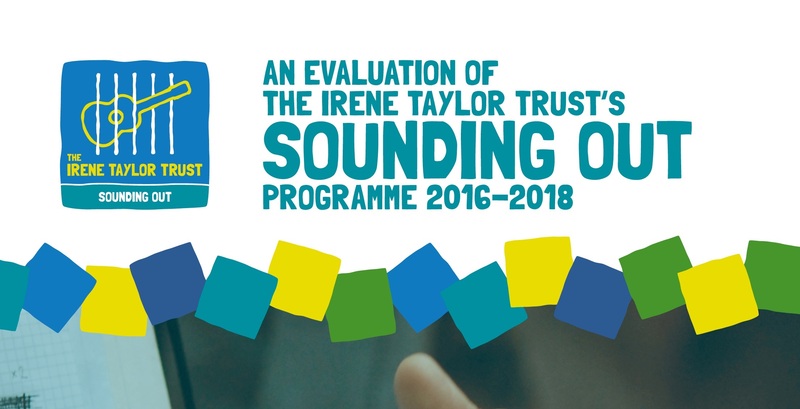 The report builds on past evaluation of the pilot cohort in 2012, reviewing the impact of the programme for cohorts of ex-prisoners engaging with Sounding Out between 2016 and 2018, and makes key recommendations for the future of the programme for the Irene Taylor Trust, the criminal justice sector and funders. The executive summary, key findings and recommendations are presented below and also available to read in this document. The evaluation is available to read in its entirety here. The Irene Taylor Trust runs a music traineeship (Sounding Out) providing ex-prisoners with longer-term rehabilitative opportunities upon their release to bridge the gap between life inside and outside of prison. Through music creation, performance, training and work placements, the programme aims to develop transferable team working and communication skills, instil discipline, increase self-confidence, self-esteem and self-motivation, improve social skills and develop mentoring skills. The Institute for Community Research and Development was commissioned to undertake an independent evaluation of the programme. The evaluation took a qualitative approach to explore the views and experiences of participants, staff and family members to understand if and how Sounding Out is successful, identifying any barriers to success and making evidence-based recommendations for improvements. building practical skills, improved musical ability, patience to work with others, and empathy through team working. The development of partnerships with and between prison and probation staff, organisations and individuals delivering the programme, families and participants, venues hosting the programme and performances, and the public. Cost-benefit analysis to demonstrate the benefits to criminal justice system and funders. The findings presented in this report highlight the impact of Sounding Out on prisoner reintegration. Sounding Out provides continuation of relationships, continuity of support, positive activity and focus, which aid resettlement and rehabilitation. The data presented in this report suggest that Sounding Out is a valuable tool in helping former prisoners develop the skills and confidence needed to live crime-free lives. Criminal justice policy makers and leaders advocate the value of programmes like Sounding Out in supporting prisoner reintegration and rehabilitation. We recommend this takes the form of policy briefings, and active guidance to criminal justice staff on making the most of the offer from the voluntary sector. When changes of leadership occur in prison, governors formally recommend continued support for programmes like Sounding Out. The benefits Sounding Out can bring to prisoner reintegration are clear, and prison governors can play an important part in advocating and facilitating continued relationships between prisons and organisations. Relevant funding streams are identified through existing mechanisms such as education commissioning or new funding streams for bespoke programmes. Metrics monitoring equity of access for people likely to benefit from the programme are included to secure delivery of Sounding out and related programmes. Metrics in line with those used for activities such as education and employment would be beneficial. That criminal justice staff continue to work to facilitate beneficiary access to programmes like Sounding Out. The practical examples presented in this report – Release On Temporary License and varying bail conditions – highlight the important part criminal justice staff play in ensuring beneficiaries can fully engage with programmes. Prisons identify a named member of staff to work with the Irene Taylor Trust to identify participants for Sounding Out. Sounding Out works with prisons and probation to support resettlement and aid rehabilitation. Prisons could make the most of the opportunity by working more closely with Irene Taylor Trust staff and Musicians in Residence. The recommendations below are aimed at aiding funders to make decisions that most effectively support organisations like the Irene Taylor Trust, and allow them to flourish. Recognise the value of Sounding Out in delivering outcomes for individuals and the potential for cutting the costs of crime to families and communities. Appreciate the importance of investment in relationship building programmes like Sounding Out. Relationship development is fundamental to the success of Sounding Out, but also very time intensive. Be receptive to requests for longer-term support, either for whole projects or elements of projects. Encourage organisations working in the criminal justice system to seek funding for capacity building. The significant challenges of working with the criminal justice system, as highlighted in this report, requires investment in organisations that goes beyond the remit of individual projects. Provide a level of flexibility in funding arrangements to enable organisations to be responsive to changes in the criminal justice system. This might include where considerable time has been spent on vital relationship building, only for prison staff to change. Read the executive summary document here.